The Lincoln Square Ravenswood Chamber of Commerce brings a wonderful way to explore classic cuisine and fine dining at restaurants throughout the two neighborhoods. Restaurant Week will take place from Sunday, October 14th through Friday, October 19th 2018. In attendance will be a diverse assembly of neighborhood restaurants. Each participating restaurant will offer a prix fixe menu. 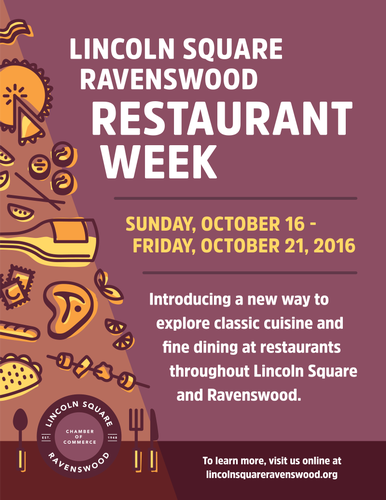 At week’s end, guests will have had the opportunity to see and taste the best of Lincoln Square Ravenswood — a true food lovers' paradise. FOR A COMPLETE LIST OF PARTICIPATING RESTAURANTS VISIT THE EVENT PAGE.